The root word for courage comes from the French and means “heart.” True courage can only come when we are speaking out or taking action from the heart. For me, this seed of understanding took root and began to grow in December of 1997. While traveling west with friends, I experienced the ancient redwoods in person for the first time. I was deeply and profoundly touched by their beauty, majesty, and ancient wisdom. I felt like I had walked into the most sacred of cathedrals. A few weeks later, I found out that over 97 percent of these trees—that grow to be 200 to 300 feet tall and 2,000 to 3,000 years old—have already been logged and that they are continuing to be cut down with highly destructive industrial logging practices. I could not believe this was happening. I felt like I should do something to try to help stop this atrocity from continuing, but I didn’t know how or what to do. Then, I heard that people were living in trees in order to protect them from being cut down and to try to bring attention to the issue. I thought to myself, “I could do that!” I grew up with two brothers and no sisters, so I knew how to climb trees! I wasn’t quite sure how to be an activist. I wasn’t even sure what that meant exactly. But tree climbing was something I knew how to do, so I volunteered. When I climbed 180 feet up into the branches of a 200-foot-tall, over 1,000-year-old redwood tree, now known as “Luna,” I thought I would be there for three weeks to a month. It turned out to be over two years, 738 days to be exact, before my feet would touch the ground again. In that time, I faced many challenges that left my heart, spirit, and body broken. There were so many moments where I wanted to give up. Yet every time I felt myself in this space, I would pray and ask for strength. The funny thing is I would always get sent more challenges. Finally, I realized that I was receiving what I had asked for because the only way we get stronger is through exercise, including the exercise of heart, mind, and spirit. Every challenge then became an opportunity for learning and growth. It was in this way that I realized that every moment, every day, every choice is an opportunity for courage. Every time I choose to act consciously out of my love for my world, no matter what the status quo says, no matter how difficult the choice might be, I am living a life that has meaning, joy, and true power. No matter how dark things in our world seem sometimes, I am the only one who can consciously choose to shine a light of caring, commitment, and courage. It really is a moment, by moment, choice. Yes, we need the “big” acts to encourage and inspire us, but it is only through looking at these as examples to empower ourselves, that we find the extraordinary person that lives within the heart of each and every one of us. Julia Butterfly Hill climbed the 1,000-year-old Redwood in order to stop loggers from cutting it down. 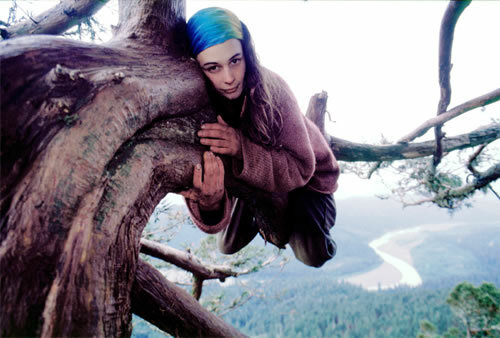 Little did she know she’d remain in its canopy, defying the scare tactics of the logging company, for two full years. Julia received international attention and went on to become an international speaker, author, and life coach.